One of the challenges facing occupational therapists in daily practice is that, in general, people don’t know what it is that we do. When people learn that I am studying occupational therapy, they frequently adopt a confused expression and ask more questions about what an occupational therapist does. To help people understand my role, I often compare occupational therapy to physiotherapy since people tend to have an understanding of this role. So, generally speaking, physiotherapists work with a person to improve their physical ability, perhaps following an injury or surgery for example. Occupational therapists work with people to further develop their skills in real life situations that they will find useful in everyday tasks. For example, a physiotherapist may work on a person’s range of movement using physical exercises and the occupational therapist will work with the person to use or maintain this range of movement to move around their kitchen and make themselves a meal or a hot drink. An occupational therapist can work in almost any setting with people of any age to overcome whatever barriers may be preventing them from doing the things that are meaningful to them. These barriers may be physical, psychological or both. An occupational therapist may introduce the person to new ways of doing things or provide them with assistive equipment to help them. What did you do on your placement with Alzheimer Scotland? This placement was different to my previous experiences where my role was prescribed, or already established, within a certain field. 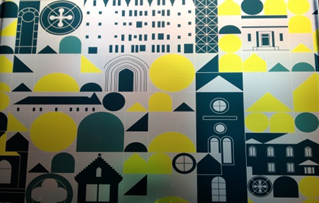 Within Alzheimer Scotland, I was given the opportunity to experience a range community settings including the homes of people living with dementia, local cafes, places of worship, educational institutions and hospitals. I was free to choose how I worked, along with team members, identifying people I thought would benefit from occupational therapy input. In doing so, I created some basic occupational therapy assessment paperwork and created a few sensory resources. I also helped to facilitate an art group, visited local buildings and gave advice on how to make them dementia-friendly. 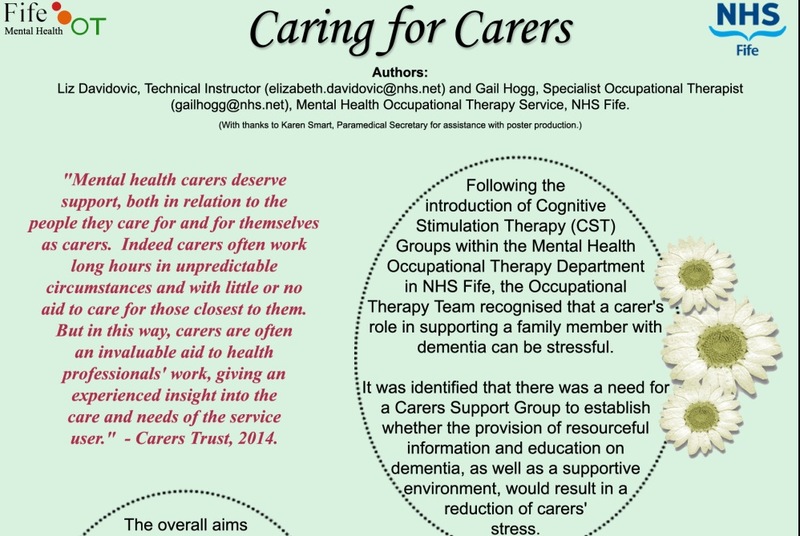 For my main project, in order to meet my course targets, I worked with children at a local Primary School to develop activity sheets aimed at helping other children understand dementia. Every setting was different but I don’t think I would have had these opportunities or experiences on other placements and I very much enjoyed the work I did. 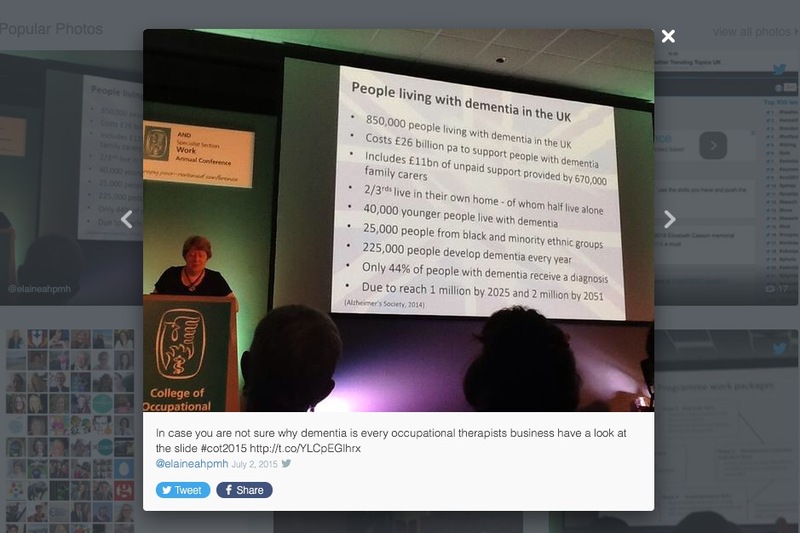 Throughout this placement I used social media (Twitter and Pinterest) to promote occupational therapy, to gather resources and see what other professionals or people are saying about dementia. This was totally new to me but I think it is a great way to communicate with other professionals and to promote good practice. I won’t speak more about the use of social media as there is another posting on this blog by one of the Alzheimer Scotland occupational therapy interns, Christopher Cousins, regarding the use of social media in healthcare. What do you see as the benefits of role-emerging placements for AHP students? I think most occupational therapy students would agree with me when I say that the clinical placements we undertake as students affect the knowledge and skills that we graduate with, and influence our career path within occupational therapy. Occupational therapists can work in such a wide variety of settings that it is next to impossible for us to study each setting or subject in great detail. By undertaking my placement with Alzheimer Scotland I have had the opportunity to work in the community with many lovely people, carers and families from various cultural backgrounds; I feel that I have increased my own knowledge and understanding of dementia and my personal experience of working with people living well with dementia, their families and carers. Having explored a range of services provided in the community, I feel better equipped to help people access appropriate services – for the person living with dementia and their families and carers. I have learnt on this placement that not only can Alzheimer Scotland offer a person additional supports but that I should consider other third sector services, what they offer and if I can I refer to them or guide the people, carers I work with towards them in addition to social services. 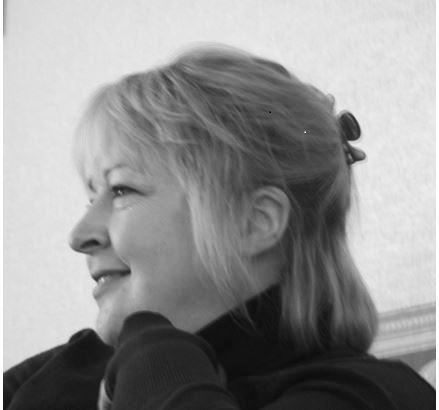 As a result of the freedom and independence I was given in Alzheimer Scotland, I have definitely gained confidence in myself as an occupational therapist. I was able to go into a setting that doesn’t currently have occupational therapy, and work towards establishing a new service. This makes me wonder where else I could use my occupational therapy profession? have you experienced a role-emerging job or placement? 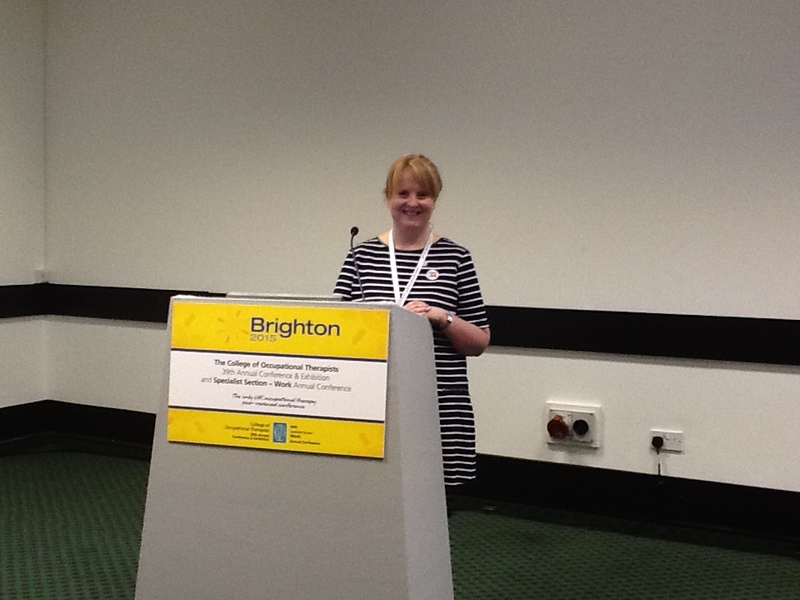 where would you like to see occupational therapy in the future? what other possibilities do you see for our profession? Thanks for reading my post. 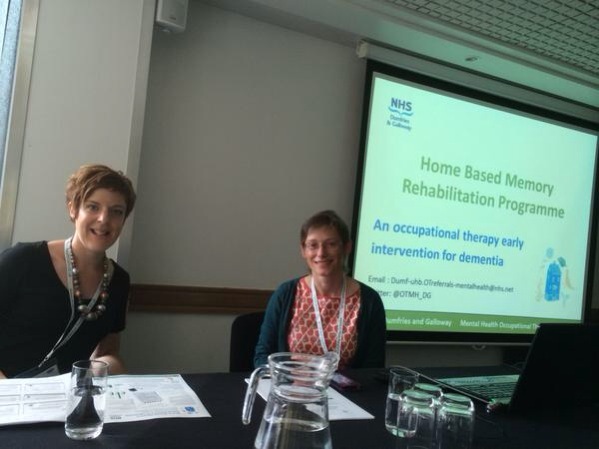 I hope it has given you some insight into the benefits of AHP students undertaking role-emerging placements in Alzheimer Scotland and encourages you to think about the possibilities of AHP practice within third sector services and beyond. I am currently a 4th year occupational therapy student at Queen Margaret University. I recently finished an 8-week, role-emerging AHP placement with Alzheimer Scotland. Can you tell us who Kari is? Hello, I am Kari Milsom, I live in Yorkshire and I’m in my final year studying part-time for an occupational therapy degree at York St John University. University is a new venture for me as I have been working full-time for 30 something years, mainly in the voluntary sector developing services for people who are facing challenges in life. When I am not studying part time as an occupational therapy student, I am the National Partnership Manager, responsible for the care and maintenance of the dog and client partnerships for life, there are over 800 Hearing Dog partnerships in the UK with lots in Scotland so it is a big team to manage but I love it! 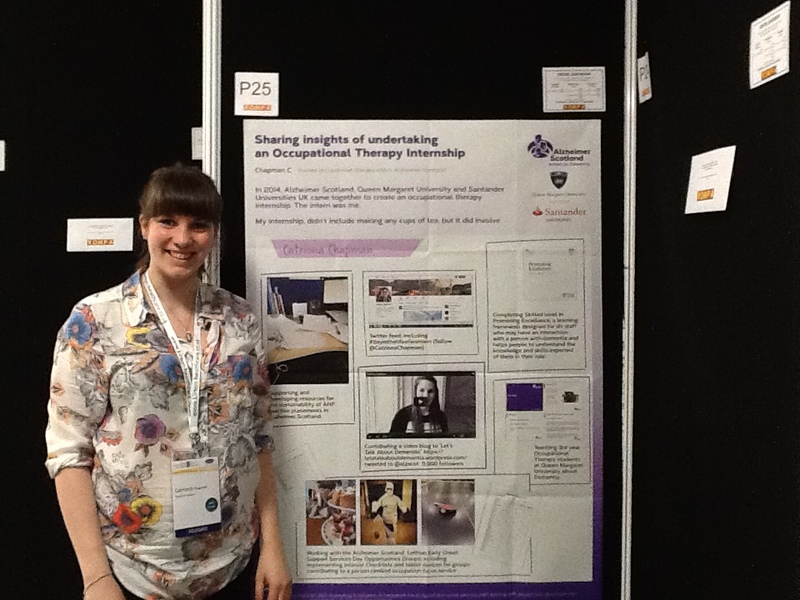 Can you tell us about why you wanted to come to Alzheimer Scotland for your final year occupational therapy placement? Studying is not all about theory and books, student Occupational Therapists need to do a minimum of 1000 hours practical placement working in both physical and mental health settings in NHS and social services. My placements had been in Community Adult Rehabilitation, Adult Neuro Rehabilitation, Paediatrics and for my final placement I wanted to gain an insight into what is considered a “non-traditional occupational therapy” setting. I immediately thought about Alzheimer Scotland. I was drawn to their innovative project, working with Dogs for the Disabled and the Glasgow School of Art, The Dementia Dog project. For me this was my ideal placement. I felt I could learn and contribute to this fantastic project, linking my new and developing knowledge of occupational therapy and in return bring my years of dog expertise into play. Can you tell us about your placement in Alzheimer Scotland? The main focus of my occupational therapy placement is the Dementia Dog project. 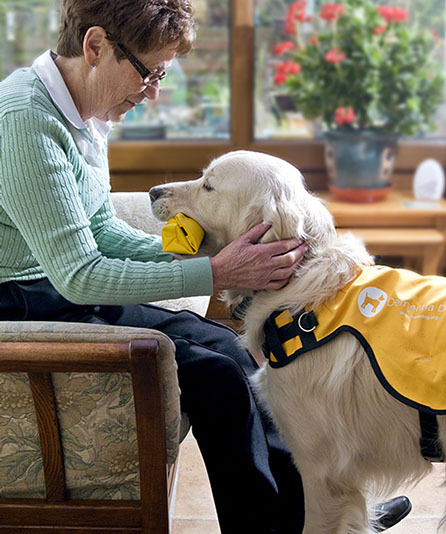 The Project is made up of quite a few areas; there are the assistance dogs which are out working in the home with people living with dementia in exactly the same way as a Hearing Dog or Guide Dog would work, out and about with their distinctive jackets on. 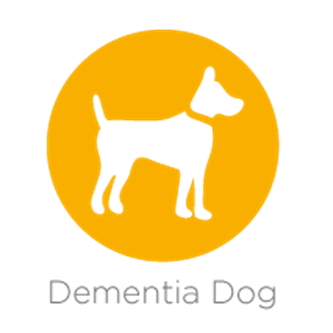 Predominantly I am working on Dementia Dog Days at Alzheimer Scotland Resource Centres, allowing more people with dementia to experience the value a dog can bring in helping with communication, memory, storytelling and mobility. I am also doing a lot of research to look at the “art and the science” behind why dogs make a difference in these areas. The wonderful thing is that all this work is so occupational therapy focussed, how through occupation with the dog, people with dementia are able to engage in a new spectrum of activities or how having a dog involved helps the retention of activities of daily living, independence and being able to stay in your own home for longer. 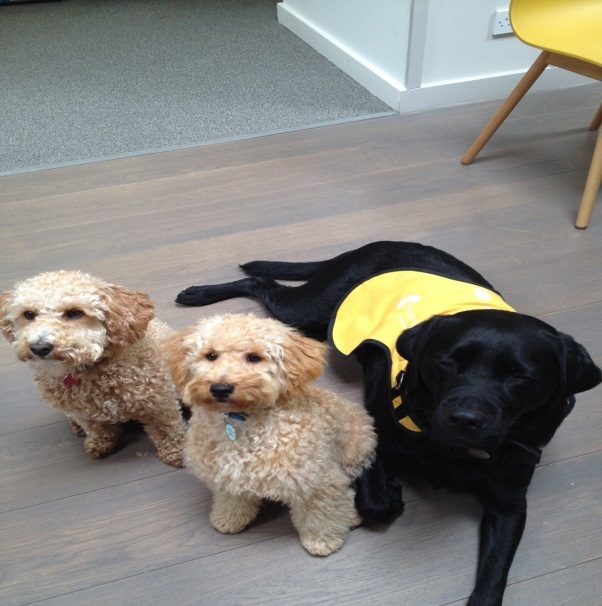 Poppy, Albert and Alex at our Dementia Dog Day in Kilmarnock. 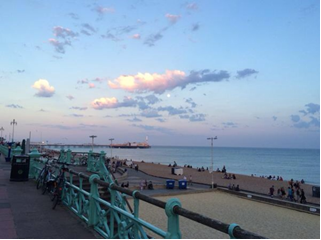 Where have you been on your placement? 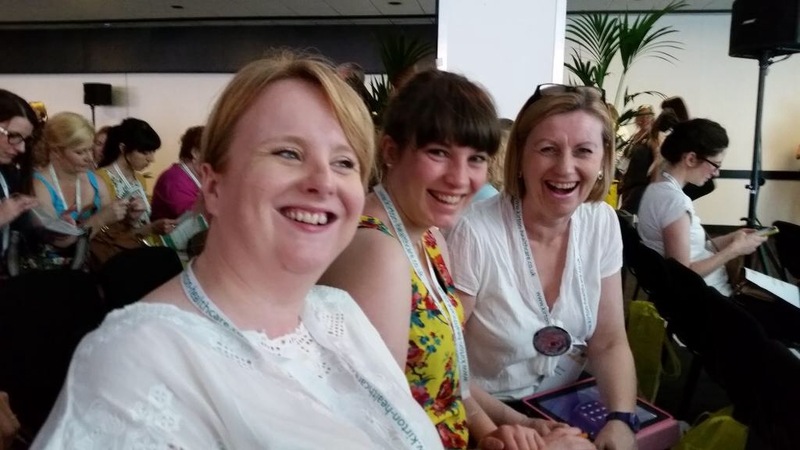 I have been to the Alzheimer Scotland Conference in Glasgow, my arms were aching with carrying all the information I found and my voice was hoarse through chatting to so many people. I’m linking with the policy team based at the Alzheimer Scotland national office including the two occupational therapy interns Lyndsay and Chris along with the music therapy intern Rebecca. NHS Education Scotland have adopted ‘Dementia Dog’ as their charity of the year so I’ve been doing some promotional work over there too. I’m helping set up Dementia Dog sessions with the Alzheimer Scotland Day Care Team at the Dementia Resource Centre in Dundee and a big chunk of my time is spent at the beautiful Dementia Resource Centre in Kilmarnock. Everything in there is so dementia friendly and they are setting the trend for how accessible and inviting a space Alzheimer Scotland services can be. It has to be the people. The people living with dementia who share so much of their time with me and always seem so happy to answer my questions, it’s a real privilege to spend time with them. Also the staff and volunteers at Alzheimer Scotland, I have been made so welcome by everyone, the teams work so hard and with such care and attention for their clients, it’s lovely to see. And last but not least the dogs: Alex 4 Paws, Poppy, Albert and Bo. All working in their unique ways to add to the quality of life people living with dementia. Kari is currently on placement with Alzheimer Scotland and the Dementia Dog team as part of her final degree year via York St John University. Kari’s substantive post is with Hearing Dogs for Deaf People and upon completion of her degree she will be heading up the Applicant Engagement section as Consultant Occupational Therapist for the charity. 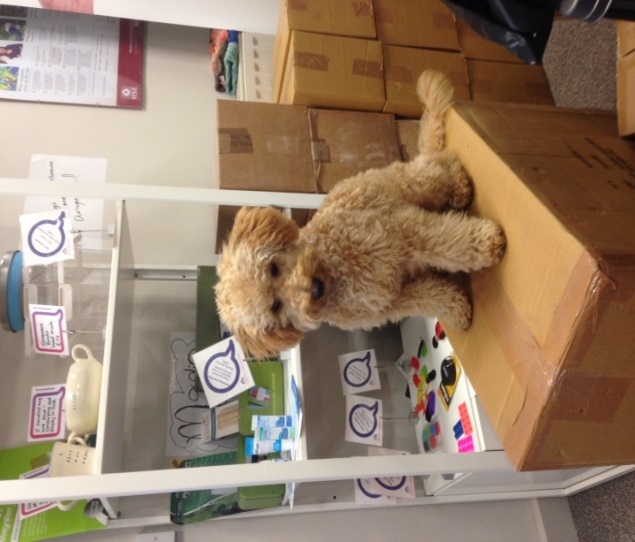 As part of the Dementia Dog team, Kari is creating a Tool Kit for the role out of Dementia Dog Days at Alzheimer Scotland resource centres and creating protocols for dogs to be incorporated into therapeutic activities.